My primary focus as a photographer has always been landscape. That is what I am most comfortable with, and what I enjoy the most. Since I've picked the camera up once again several years ago, that is what I have done almost exclusively with the exception of some action photos of my wife during some runs. Once upon a time though, I did a good bit of studio work. I found that to be a great diversion when the weather wasn't cooperating with me, and it allowed me to experiment with other sides of photography. For some reason, I have not really gone back to that in quite some time. A friend of mine at work changed that about a week ago when he contacted me about doing something special for an officer that was going to be leaving the department at the end of the month. You see, since she had not made it to a retirement point, she was not going to be able to have a badge presentation done. 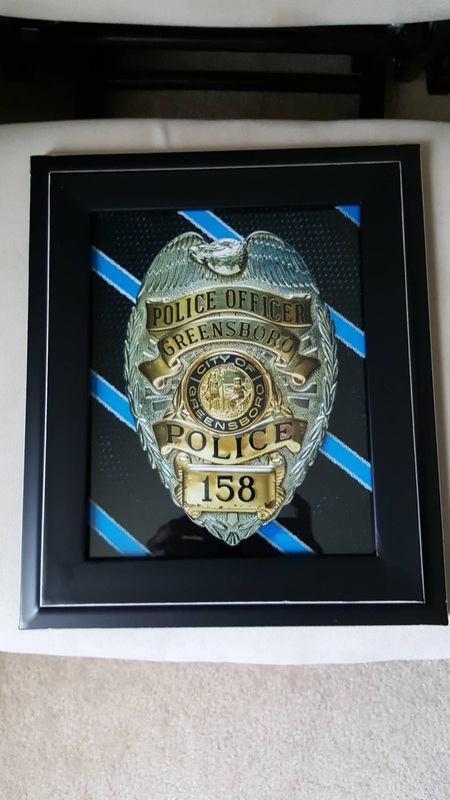 Her Sergeant wanted her to have her badge for the years of service that she had given the city, and figured that the next best thing would be a picture of her actual badge. Well, since he is a friend, and also a client of mine, he reached out to me to see if I could help him out. 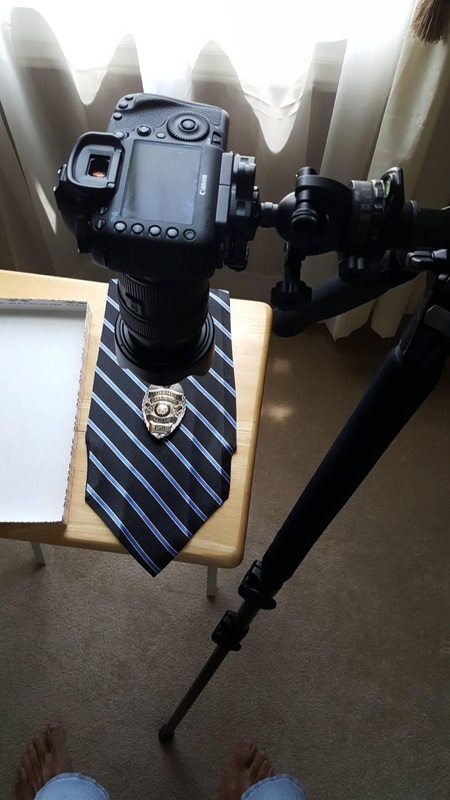 Hmmm, take a picture of a badge and frame it. Sounds easy enough, but there is so much more to it than that. I was going to have to work out the lighting and the execution of the picture. I didn't want it to be an average picture at all. I was hesitant to say I would do it, but knew that I had some experience with this type of picture from my studio work from years past. I agreed to the project and I had a badge of her's by the end of the day. It took me a solid week to figure out how I wanted to shoot it. I was looking at different backgrounds that I could use. I thought about plain ones, but that was boring, and didn't quite fit with my vision. I thought about using an American Flag in the background similar to a pencil drawing I have of my badge...but that was going to be too busy with the colors. I was stumped. 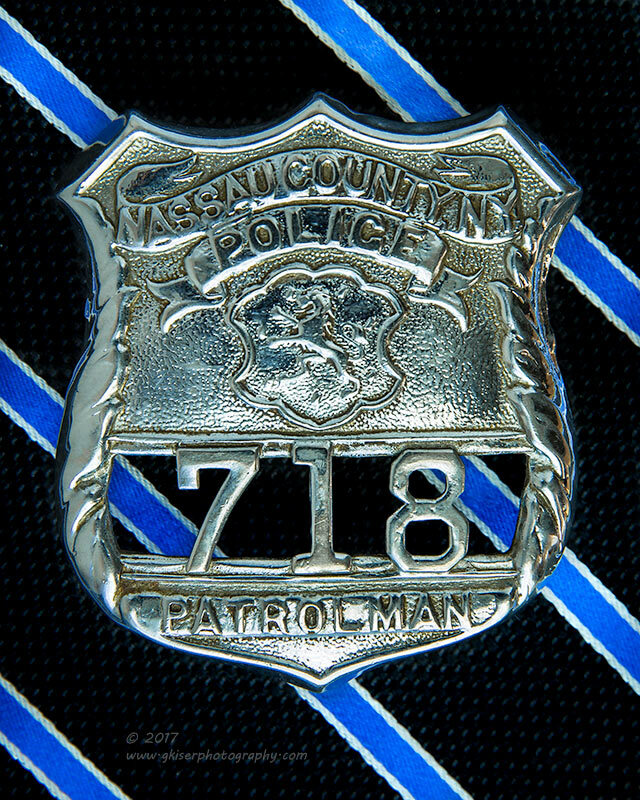 At least until Sierra suggested using a thin blue line behind the badge. Hmmm, that could work!! I started putting ideas together to make that happen, but didn't really like any of them. 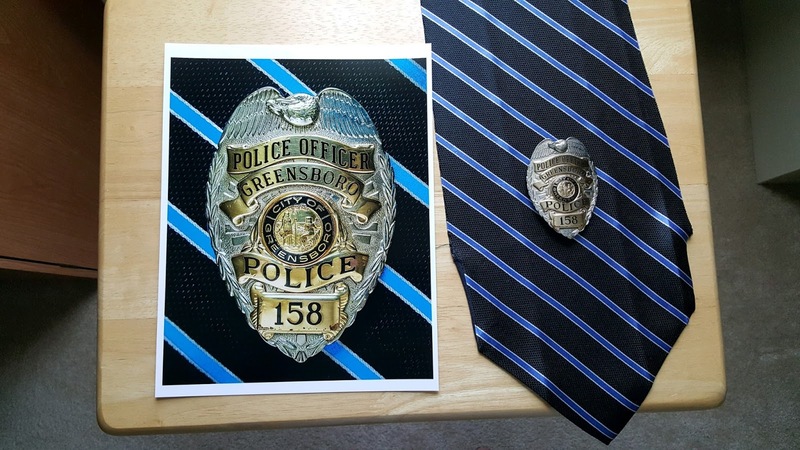 Then Toni showed me a picture of a tie online. It was black with blue stripes spaced evenly. All of a sudden, it all came together. That was what I was going to use! At least I thought everything was all figured out. That was until we went looking for fabric in that print. You know what? Black with blue lines is a very difficult thing to find. We went to arts and crafts stores, fabric stores, and even a party store. Nothing even remotely like what I was looking for showed up. We went home and we started to look online for something that we could maybe find in a store. That didn't work either. We got desperate and started to search for ties again to find a store that might carry one. It looked like JC Penny's would be the best bet, and that meant a trip to the mall. Oh Joy!!! That was a very long trip to the mall looking in all sorts of stores. It would seem that the print that I was looking for was very hard to find. I found a lot of blue on navy blue, but that wasn't what I was after. I could find lots of black ties, with silver stripes, or gold...but not much blue. There were a couple that might have been close, but just didn't have the right feel to the print, or were $50 or more.. After about a dozen stores in the mall, I went into Belk. They had a bunch of ties, but it didn't seem like they had any that remotely fit the bill. I was about to give up when I found a black tie, with a nice texture to it, and blue lines going diagonally. The only nit, was the pinstripes that were added to separate the blue and the black. I was tired, and this was going to have to do. It was a $50 tie, marked down to $24.99. That was the cheapest tie I had found. When it rang up, it was further marked down to $13.00!!! Now I won't feel bad about cutting the tie open to use as a background. 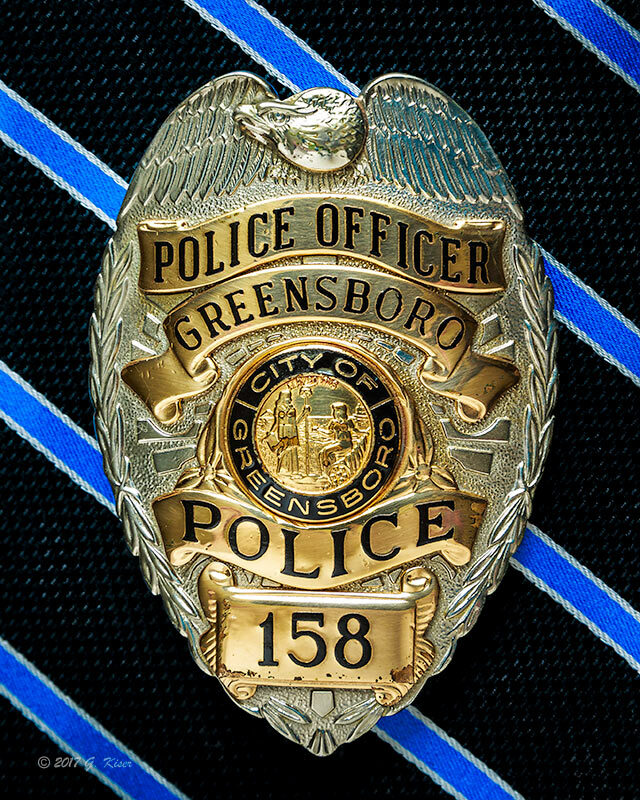 I positioned the camera directly above the badge, and fitted my 24-70mm lens. It was the closest I had to a macro lens, and was my best shot at getting in close to the badge to fill the frame. I also added a polarizer since I wanted to minimize glare on the metal surfaces, and help to saturate the background material. Since I was using my office window and the sheer curtain to light the scene, I went ahead and added a lens hood to block the sun. As I suspected, the light was too heavy on the top of the badge, and needed to have a little fill light from the bottom. Well, that was easy enough, I added a reflector on the bottom of the badge, and bounced the light back onto it. To be honest, I use the term reflector loosely at best. I used one of my paper box lids which was white to bounce the light. That evened things out rather nicely. I set up my exposure and shot the first frame. It seemed to come out exactly as I wanted, but I shot an additional two frames with the reflector positioned slightly different each time. As it turned out, my first shot was the one I went with. It took a little bit of post processing to get it to turn out exactly as I had envisioned it, but even that only took about 20 minutes. After some final tweaks, I was ready to print it out as an 8x10" print. It came out just as I had imagined it, and I was quite proud of this one. My first studio shot in about seven years had turned out very good. In fact, I have been showing it off to other officers, and expect to see some orders for something similar for other badges in the future. Hey, it might not be a mountain or an old truck, but I'm proud to put my name on this one! The finished result was quite impressive. 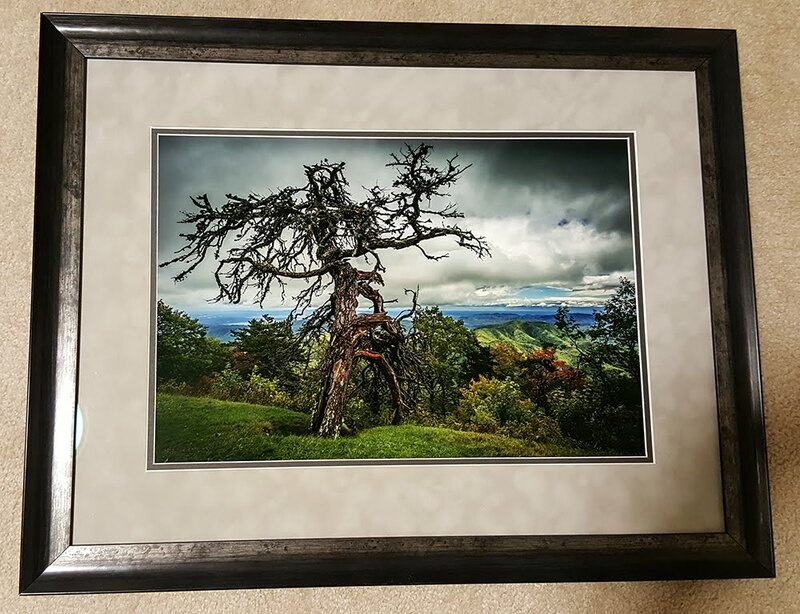 I had originally wanted to do a mat and frame, but it seemed just too heavy to do it that way, so I stepped back and did a straight 8x10" frame in black. We found one that had some silver details in the moldings that matched the highlights in the background. It all looked like it was meant to be together. Considering the amount of time I have been away from doing this type of photography, and the fact that I am not really set up for it anymore, I have been nothing but pleased at how it all turned out. The hardest part of the whole process was sourcing the background. At least I got a good deal on it, and I'm hoping to be able to use it again for other badge photographs. I can see a lot of potential with this, and you can bet I'll be exploring other options for this product. For this particular one, I was able to keep the final price at $59.00. Considering the sentimental value here, I would say that is quite reasonable. These are not just limited to my agency. I am able to use any badge, as long as I can have possession of it for a couple of hours during the daylight preferably. Here are a couple of my recent additions from the NYPD. 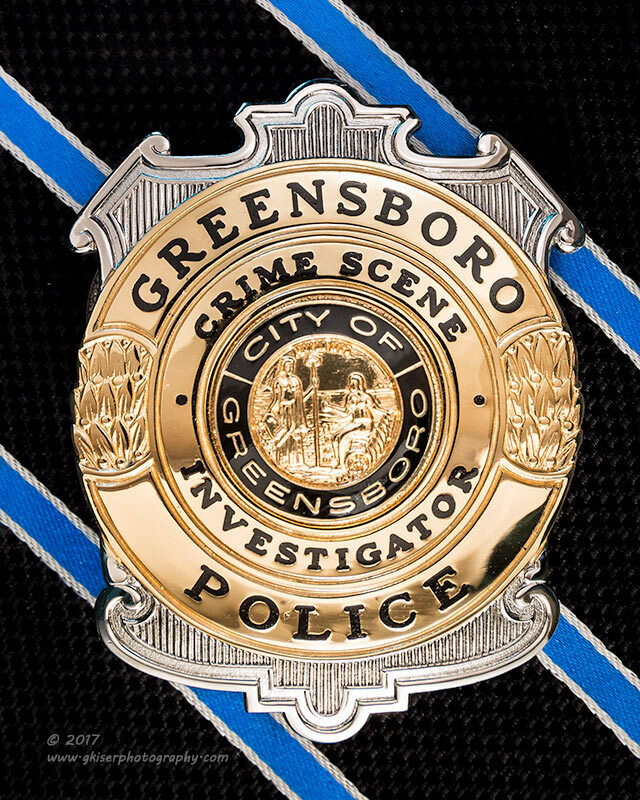 I am now able to offer these pictures for any Greensboro CSI as I have a file for the badge available now. Since these are not specific with a badge number, I am ready to make a print and deliver your framed keepsake in very short order. Of course, if you would prefer, I can shoot your personal badge with no problem. 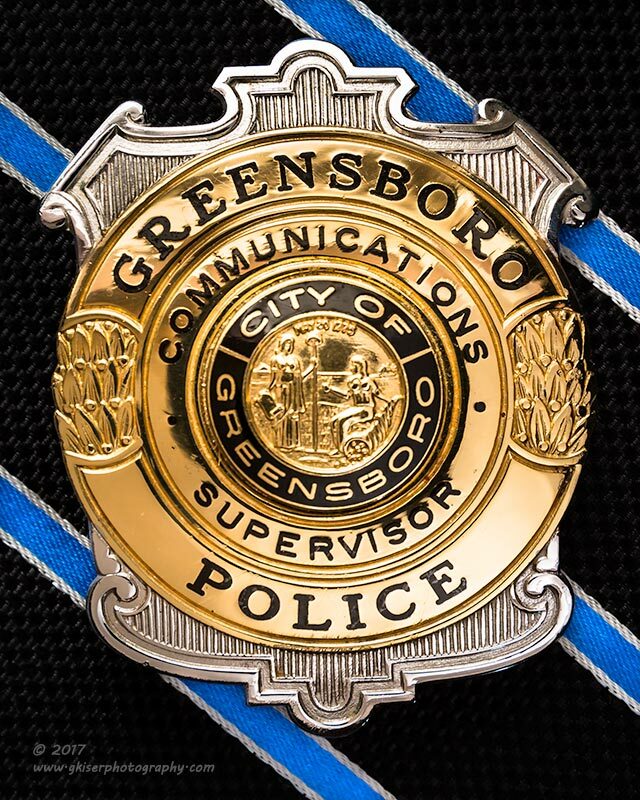 Added to the collection is the Greensboro Telecommunicator Badge for a Supervisor. 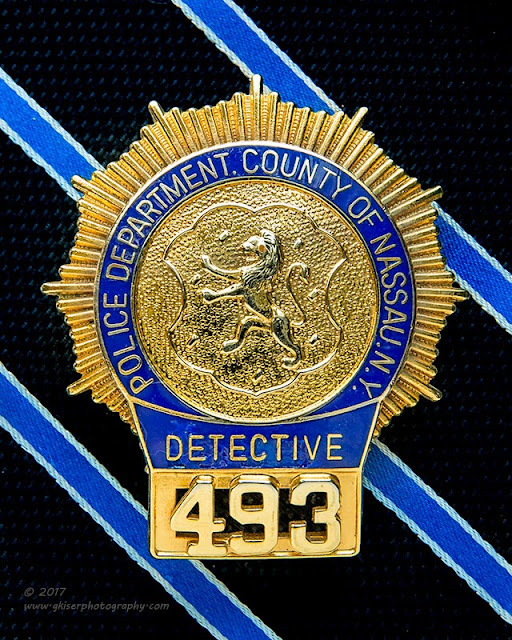 While these badges are no longer in use, there were quite a few supervisors over the years that had this badge. Since there is no badge number associated with it, I can reprint this picture for any of our supervisors. What does one do when he is left at home alone on a Saturday? He plans a trip to the mountains to try to find some great clouds. Toni was at work, and Sierra was at my Mom's for the weekend. 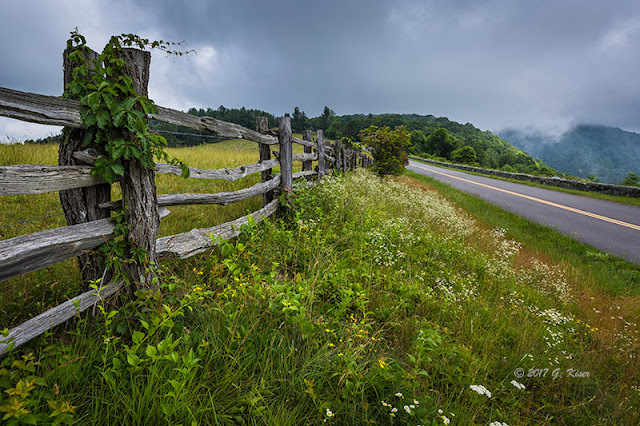 That meant that I could go and spend the day on the Blue Ridge Parkway if I so chose. Well, with 70% cloud cover forecasted for most of the day and a couple of storms in the afternoon, it was my kind of day on the Parkway! The only problem was, in order to get a sunrise, I was going to have to be on location by 5:30am. Doing the math for Rough Ridge, that is about 20 minutes to hike in the dark, and about two hours drive time....carry the 1. That means I would need to leave around 3am. Not too many years ago, that was my bedtime on a regular night. Now I'm looking at getting up a 2:30am just to go take pictures? I could wait and just concentrate on the sunset, but I do like getting out there before anyone else is stirring. Well, I did manage to get up at 2:30 somehow, and was out the door a little before 3. The trip to the mountains went smoothly except for the fog that developed as I was climbing into the mountains. It was so bad, I couldn't tell my turn to get on the Parkway and turned onto what developed into a one lane dirt road. There was no way to turn around, so I had to back down to the road to get another block up. That was fun...well not really...but I did get back on track and found the Parkway. 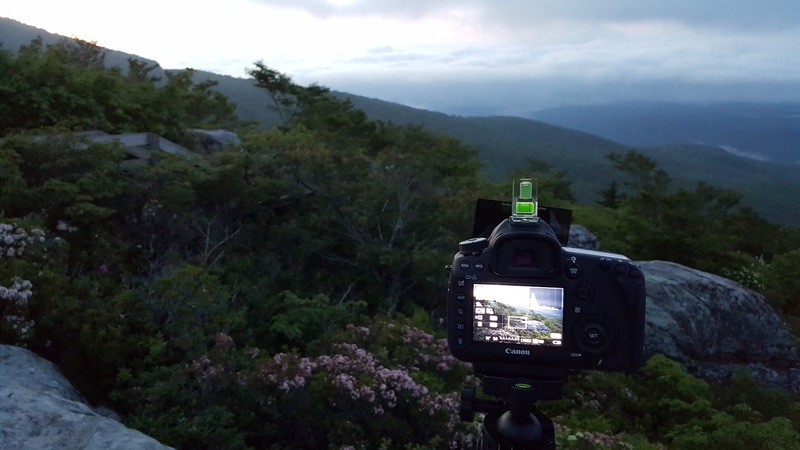 It was slow going through most of the 30 some miles I had to travel to get to Rough Ridge, and I was really wondering if I was going to be able to see a sunrise with all of the fog and low clouds. I had no problems with the hike at least. This is the second or third time I've done this hike in the dark now. 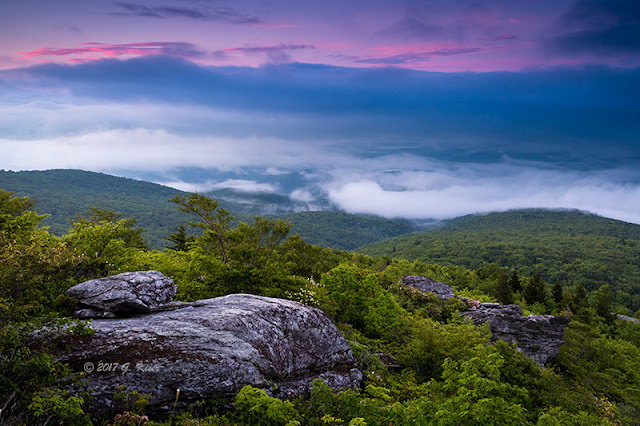 When I got up to the rock outcropping, I decided to build the camera with my 24-70mm lens and the Lee Filter Holder. I figured that would give me enough flexibility to handle most of my compositional needs. I went out on the lower level of the rocks and aimed roughly Southeast to get the distant mountains. I was expecting the sun to come up behind the mountain, so I would not be dealing with the direct sunlight. I opted for a 3-Stop ND Grad filter to control the sky, and allow the foreground to expose a bit brighter. 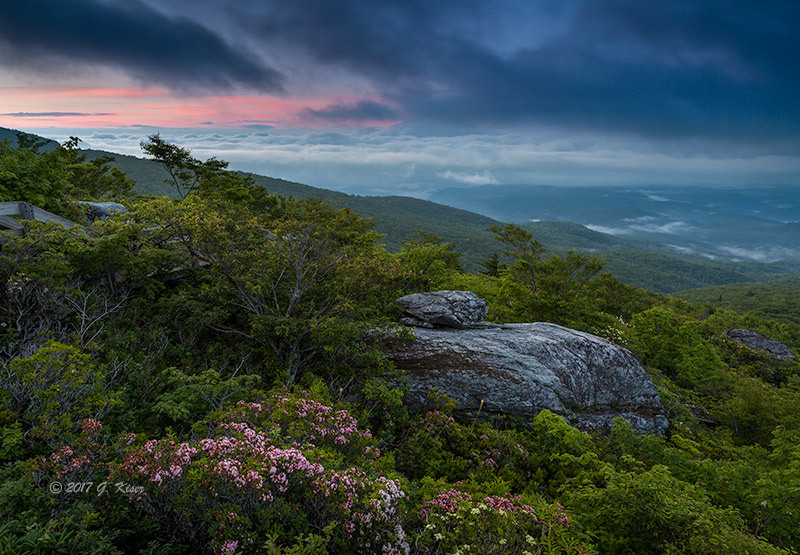 There was a nice pink bush and a rock outcrop that I was able to use for my foreground interest. These lead the eye to the cloud covered distant mountains. Once the sun started to light the sky, it came up very fast. I didn't stay in my position for more than about 10 minutes before looking for other compositions. I was able to find one almost due South which captured the different clouds that were quickly approaching my location. In fact, in just a few minutes, I was completely engulfed in clouds. I packed my gear up and hiked into the woods a bit more. When I realized that everything was covered in clouds, I reversed my track and headed back down the mountain to the truck. I wasn't sure what I had gotten, but I knew that there was precious little color in the sky. I was just hoping that the low clouds came through like I was hoping. I started back down the road in the direction I had originally come. I was wanting to work my way back to Doughton Park where I might get to do some sunset pictures later in the day. I was looking for interesting scenes to photograph, and I found a few, but they were gone quicker than I could react to them. I did find this one scene in the road construction area of the Parkway. I've photographed the bit of land many times because of the opposing diagonals that are present. This time was not really one of my favorites though, but I was at least seeing promise in the skies for the first time since being overtaken by a cloud bank on Rough Ridge. I didn't stick around here long though. I was hunting something a bit more dramatic. I wasn't sure what that was, but this scene wasn't it. The camera was packed away, and the 24-70mm lens was stored away one more time. The realization hit that I was using this lens more than any other once again. I had gotten out of that habit not that long ago, but found myself back in that rut once again. I continued North on the Parkway, until I was actually in Doughton Park. Wow!! The idea was to end up here at the end of the day. The sky was doing me no favors though, and I was at a complete loss as to what to photograph. As I got into the park, I noticed a fence that I had photographed years ago when it was broken. It has now been repaired, and is functional for the most part. The weather was being very tricky on the Parkway, but that is really nothing new. 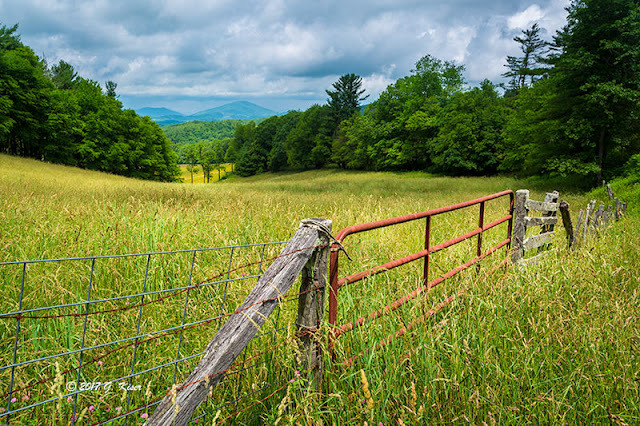 I set the camera up with the 16-35mm lens to really accentuate the fence in the compositions. I opted for an intensifying polarizer to help bring out the blue in the sky...if it were to happen at least. Finding a composition was a bit harder than I remembered here. I guess having an intact fence doesn't really give you the strong diagonals that a broken one does. As I was setting things up to get a bit of blue sky, I saw a cloud approaching quickly. As it passed by, it dropped a very quick little shower in its wake. It was kind of cool watching it rain about 200 feet in front of me while remaining nice and dry. Now the dark clouds were back in the sky above. I decided to recompose and moved up on some little white flowers. 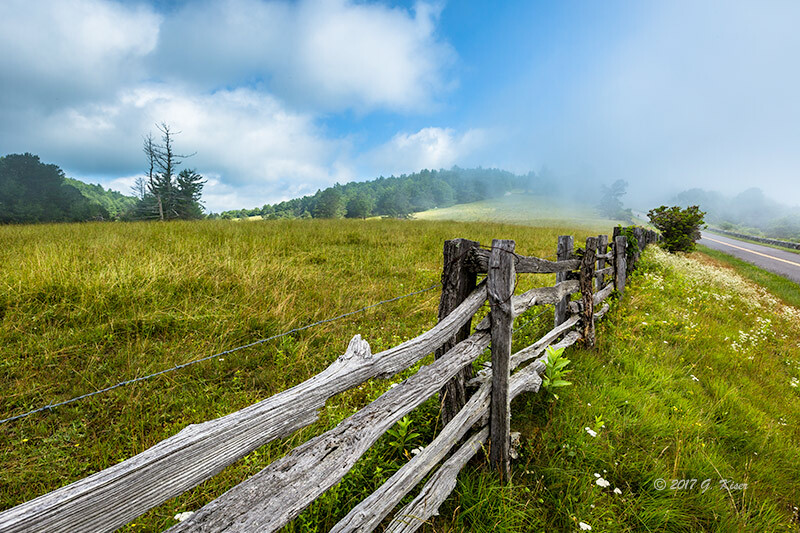 The fence bordered them to the left and the Parkway to the right. The composition seemed pretty balanced to me. I just had to wait until the clouds got enough detail in them to add to the scene. It didn't take long for that to happen. 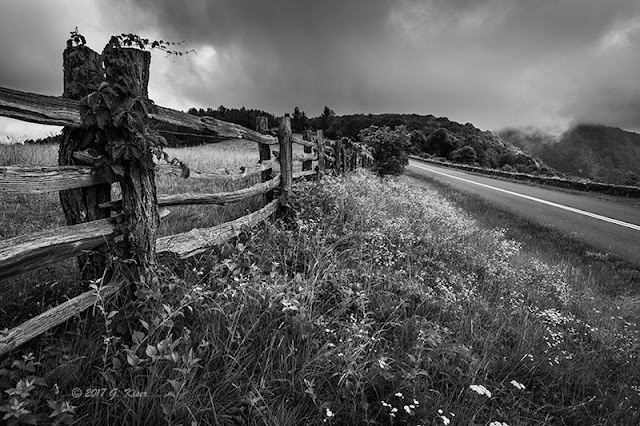 I do enjoy photographing fences along the Parkway, but this one really seemed to give me a rough time for some reason. After about 30-45 minutes, I decided to call it quits. I wasn't having much luck with the sky at all. In fact, it was starting to get completely white which means I can't do much with it. I went ahead and packed the camera up, and ate my breakfast. Well, it was too early when I got up to bother eating. Now that it was nearly noon, I realized I was hungry. After breakfast, it was back on the road to see what Alligator Back was looking like. When I got to Alligator Back, I didn't even bother stopping because the clouds were horrible. There wasn't going to be anything that I could do there. I decided to move on to the main area of Doughton to see what was there. When I arrived, I found very little that interested me so I turned around and decided to work my way back to 421 to go on home. On the way back South, I saw a scene that I have photographed a couple of times before. I was getting sleepy, so I decided to hop out and have a go of it. I grabbed my 24-70mm lens and a polarizer before setting up the composition. Normally, the gate was only a small portion of the composition, but since the grass was so high, I was able to get in a little closer to it than before. Red is one of those colors that you have to be careful with so it doesn't overpower the photograph. A new challenge presented itself with the particular setting. Since the grass was so long, any breeze would cause a wave to develop. As luck would have it, the wind was starting to pick up. I played the waiting game like a pro, and managed to get off a few shots that were tack sharp. While waiting for the sun to some different things, I looked around the area to see what else could be offered. I found a typical trail marker for the Mountain to Sea Trail, and could see that the trail was highlighted by the sun a little bit. This was worth grabbing a quick shot or two. I repositioned, and grabbed the shot before the sun went back into hiding. 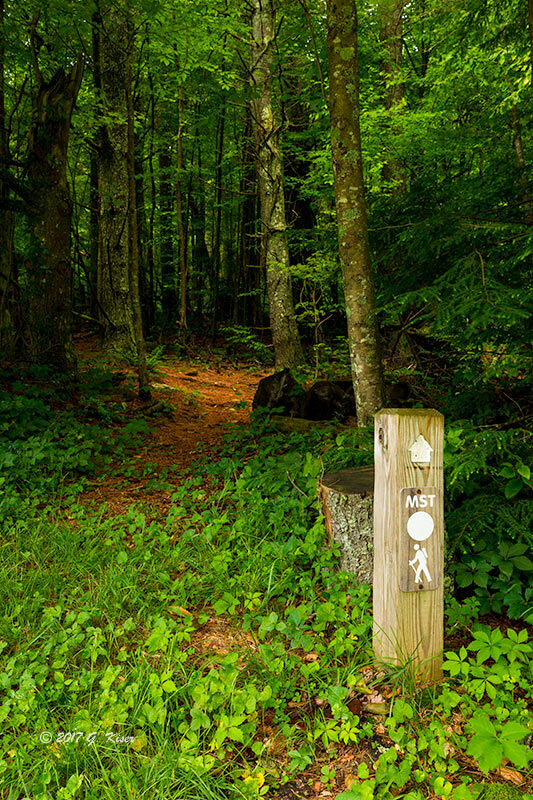 It is a simple composition, but one that will undoubtedly tell a story to those who have hiked the trail. 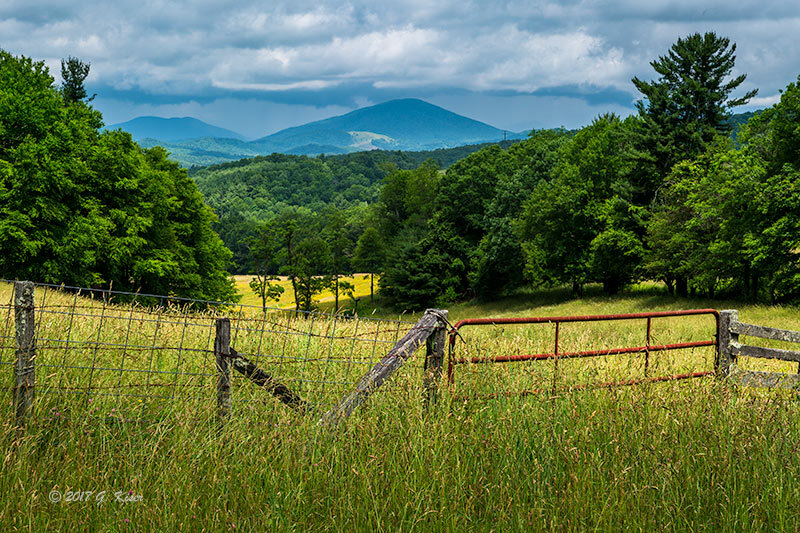 When I was done with the trail, I decided to come in a bit closer and make the gate the star of the picture. It was positioned alternate to the mountains in the distance. I actually really like this composition because of how those two elements interact with each other. 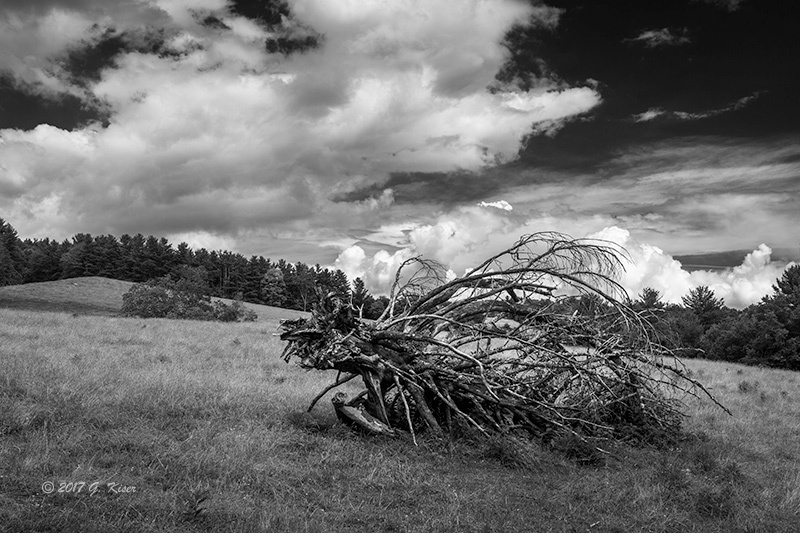 It turned out to be a very pleasing composition, and I was still able to catch the grass not being blown by the wind. I had shot a bunch of frames, but I was just now starting to feel a little better about how the day was progressing. It wasn't quite what I was hoping for, but things were starting to get a little bit better. My next stop was right around 421 (yes, I had made it back there once again). Ironically, this was one of the first places that I photographed when I decided to really take photography seriously. It was around this time of year, and I recalled there being hay bales in the field. Well, lets just take a trip down memory lane here. 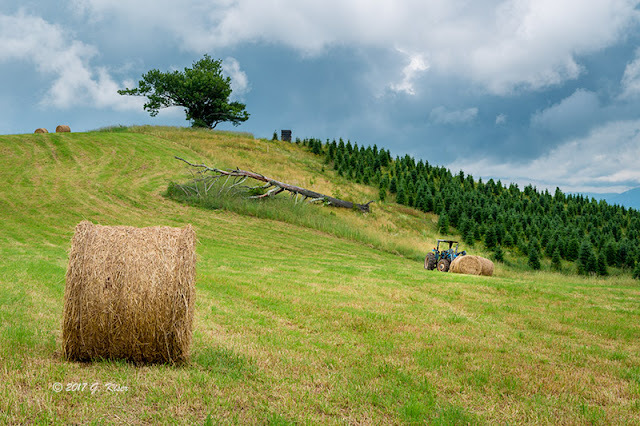 There were bales in the field just like I recalled. 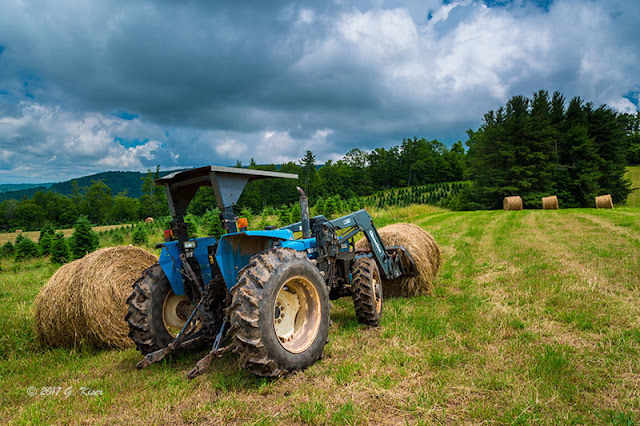 There was also a blue tractor that was obviously still in use which made it a less than appealing subject for me, not to mention that it was too far inside of the field to really make that much sense in a composition. Well, while photographing this interesting addition to the gate post, I found that the barbed wire was mostly missing from the fence in several locations. I also noticed that there were obvious paths walked through the grass at these locations. If everyone else jumps off a bridge, I guess I will too. Yep, I went ahead and crossed the fence to get into the field. I had no intentions on messing with anything, but I wanted to get some different compositions, and be able to omit the tractor. As much as I tried to omit the tractor, I found that it was in a very useful position. It allowed me to balance out the composition when photographed at around 70mm on my 24-70mm lens. 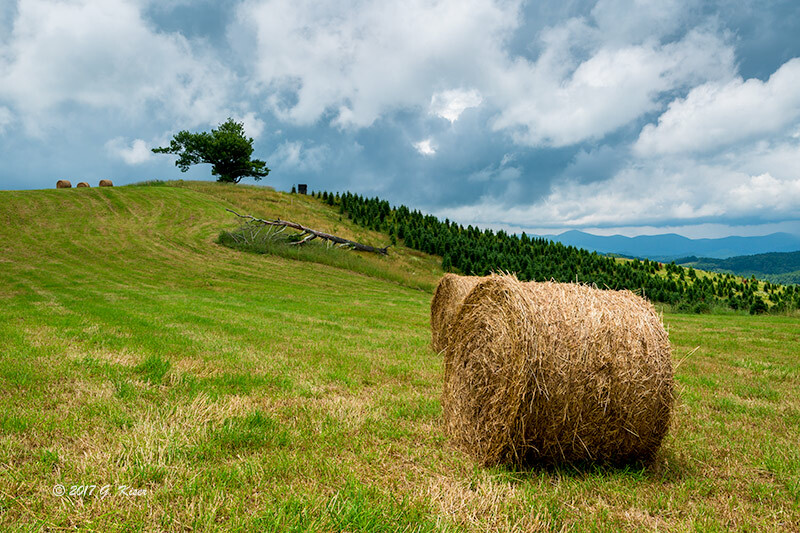 Had I gone wider and made the hay bale bigger, the background would have shrunk visually. An odd thing was happening at this point though. I was starting to dig the tractor. Maybe I was just recalling the Combine from last week, but I was willing to overlook the fact that it was still in service to be able to photograph it under the sky. I decided to forego all of the other elements in the field and just focus on the tractor. I got in close, and dropped low to really accentuate the use of the wider end of my lens. I was careful to position myself in a way that covered the large white building in the background (along 421) with the arm of the tractor attachment. This low position also gave me a great perspective on the sky, and let the trees go off dramatically to the left. I was finally really excited about one of the pictures I was getting. It is very ironic that the one element I wanted to avoid including became the star of the field! I wasn't quite ready to let this tractor get away. I changed my position and got a great composition from the rear. This tractor was just far too photogenic to skip past. 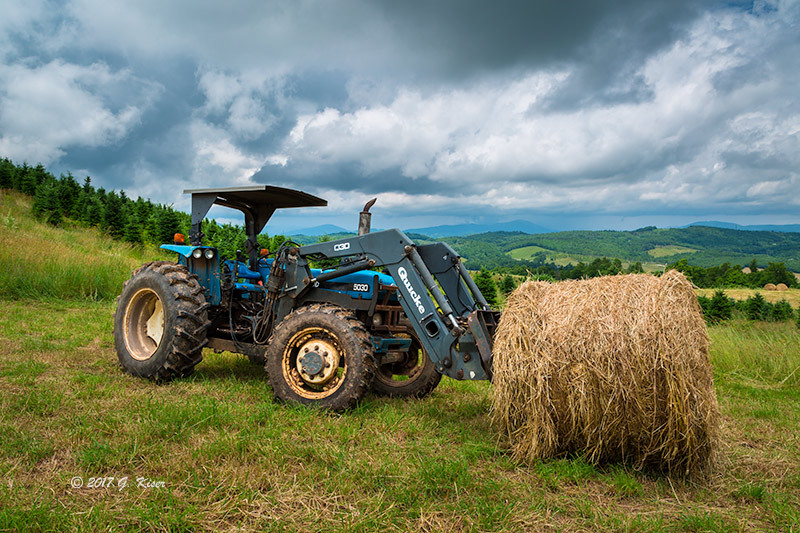 I'm so glad I ventured into the field and saw the qualities of this old New Holland. I really liked the blue color which complemented the warmer tones of the hay bales, as well as a good portion of the field. I was finally feeling pretty good about the day. I knew that I at least had something with this tractor worth keeping. I also knew it was something different from my norm, and that got me excited as well. 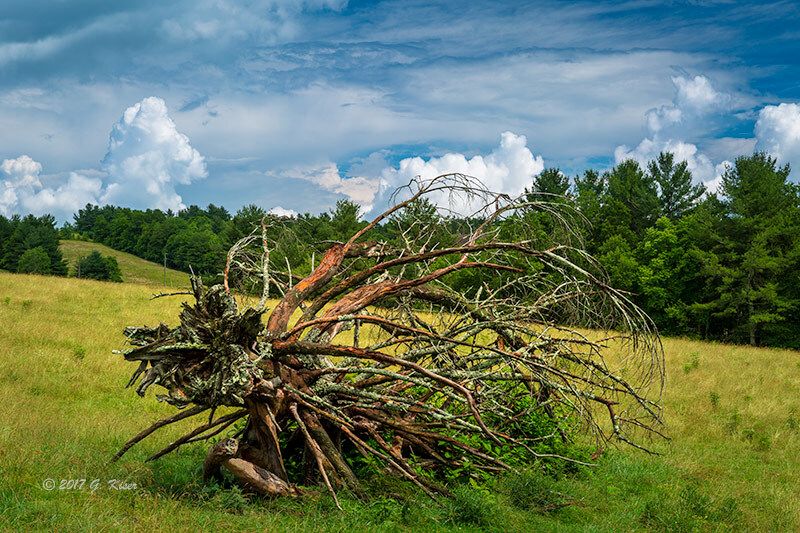 Since I was down at 421, I decided to try an old fallen tree I had already been by a couple of times this morning. The sky hadn't been good for it, but I had a feeling that the sky was a little bit better now. Well, before I made it, I got caught in a rain storm. I opted to keep driving to see if I could outrun the storm. That wasn't the case at all. I ended up at Price Lake with the rain pouring on me. I decided that I had done enough driving and I sat there for a bit. The rain eventually started to let up, and I decided to go and get some gas since I was running near empty at this point. In fact, I figured it was time to just go on home actually. I was tired, and I had a bunch of pictures in the camera. After getting gas, I was headed down 421 and thought I would do that section between the old and new highways one last time. That tree happened to be in that section, so I was hoping that the sky would work out for that one this time. It didn't take me long to get to the tree, and I found that the sky was actually pretty good. Well, at least in one direction anyway. Once again, I used my 24-70mm lens so I could include a good bit of the sky as well as the tree. For once, there was a bit of blue mixed in with the clouds. For me, that always gets my mind thinking black and white. While I didn't shoot the pictures with monochrome in mind, I did do a conversion in post to see how it would turn out. I was actually quite happy with this one in black and white, and liked it better than the color version. The white clouds had a great contrast to the dark sky, and the shadowed branches. There was a lot of texture here to take advantage of the lack of color. I'm pretty sure that this will find a way into my gallery as a matter of fact! Don't get me wrong, I also like the color version, but I think that Skinned makes a more dramatic statement in color. Either way, I have enjoyed photographing this old tree ever since Toni had pointed it out so many years ago. Of course, I can't photograph it without thinking of her either. So, this was a very happy session after the rain. Speaking of the rain, the clearing storm was making for some really interesting clouds, and I knew just the place to take advantage of them. The only problem was , it was back at Doughton Park. I wasn't planning on going back up there, but I supposed I could just take 21 through Trap Hill to get home. Well, I wasn't the only one that had that idea. 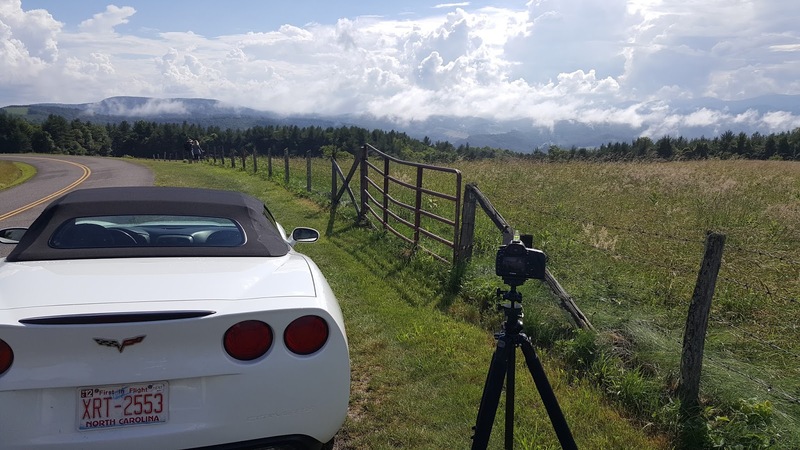 When I arrived, I found a Corvette parked in front of my favorite gate to photograph. I tried to get a shot of the gate, but the angle was just too hard to get the shot I was wanting. It wasn't looking like he was going anywhere any time soon either. I moved down to the area he was where there was another typical composition that I shoot at this location. I zeroed in on the grove of trees that juts out from the main line and shot the picture. It was ok, but nothing spectacular. I just wasn't getting enough of the sky. Wait a minute, I was using my 70-200mm lens with a 3 stop grad, so that made for a great combo for a panorama. I went ahead and leveled the tripod, and did a dry run through the entire picture I planned on capturing to make sure the camera stayed level through the track. Then I started to fire off the exposures. The resulting image is a compilation of a half dozen images shot vertically. It is a huge file, but also a very detailed one. 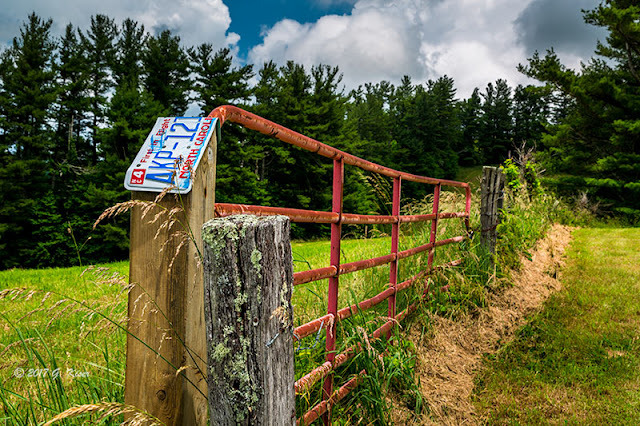 Once I was done with the panorama, I played around with some other compositions, and even swapped in my 24-70mm to see if I could get the gate to work that way. It was a no go. I was spent, and I was tired. It was time to get home. By the time I got home, I had been gone for 16 hours. Now that I am finishing up on the computer, I have been awake for 22.5 hours. It is long past time to go to bed! I started to go through some of my pictures from the day to see about doing more monochrome conversions. I had originally done a couple and only liked the one of the fallen tree. However, with fresh eyes (and more awake eyes) I saw the potential in a couple more. This panorama is a strange picture for me It is brutally simple in composition, but the story is completely in the sky. The only problem was the time of day. The sun was bright at this point, and that caused all sorts of contrast issues. The addition of the ND Grad helped the original capture, but the sky still wasn't quite "right". Not wanting to do major manipulations, I pretty much left it as it was. But with the black and white conversion, I was able to eek out some more details in the clouds, and really start to show the depth of the scene. I'm pretty happy with how this turned out, and am actually considering doing it as a canvas wrap in the living room. The next one I converted was one that already started out as a moody piece. The standout element for me on this was the spring flowers in the foreground. They were white, so while they stood out in the color picture, they didn't have quite the dramatic effect that a brighter color would have. Also, there was no sunlight on them which diluted their presence. With a monochrome conversion, I was able to negate those issues, and turn them into a texture element rather than relying on their color. The sky also benefitted from the conversion as it became a little more significant with the added depth. The weather this weekend has been less than stellar for the types of photography that I enjoy. That has pretty much kept me inside and the camera on the shelf. Well...that isn't exactly true. I've been working on a little project for a client that I will release later on in the month. Since it is a gift, I am trying to keep it a secret. The only problem is, I'm very proud of this particular project, and I can't wait to share it with everyone. As great as it turned out, I only tripped the shutter three times for the project. That left me...well...wanting more. That is where the weather came into play. For the most part, there was nothing but blue skies to be had, which hardly gets me excited to take pictures. By Sunday, I was really wanting to go to the mountains and do some landscapes, but the weather was nowhere near where I would have wanted it. It wasn't worth the drive out to the mountains, so I decided to stay at home. As the afternoon started to tick by, I noticed that the clouds were starting to move into the area. not much, but enough. I started going through my memory to think of places that were close by that I could hit around golden hour, just before sunset. 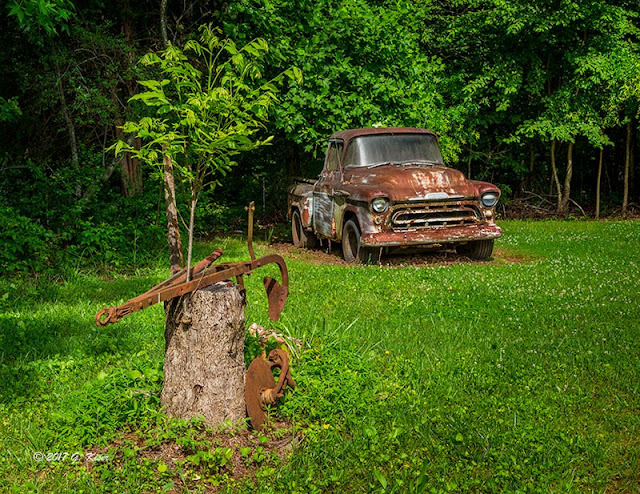 For some reason, this old piece of yard art came to mind in Yadkin County. 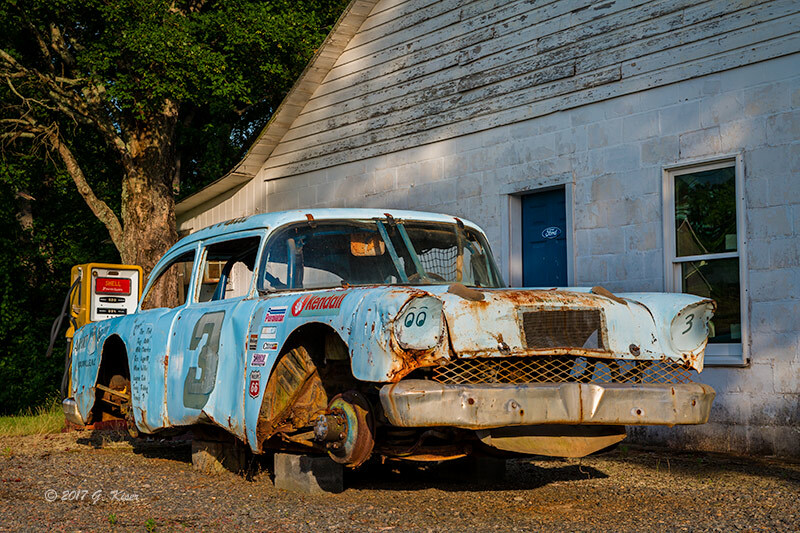 I have driven, and ridden my bike past this old blue race car numerous times. I have even pulled over and tried to photograph it before. It was never the right time, or the right conditions. I'm not sure why, but I was unable to shake the vision of this old track car. That usually means I need to go out and photograph what I'm locked on because my subconscious is telling me that something great is about to happen. At least that is how it seems. I didn't have much hope for this car, and in fact I was already thinking about plan B's when I got to the car and decided it wasn't a good candidate. Well, after dinner, I had kind of cooled my jets on the car as the clouds were starting to fade away. I wasn't really interested in photographing the clouds, but I wanted a bit of diffusion in the light. Well, I had listened to the voices in my head enough to know that I had better go on out there to see what they were talking about. 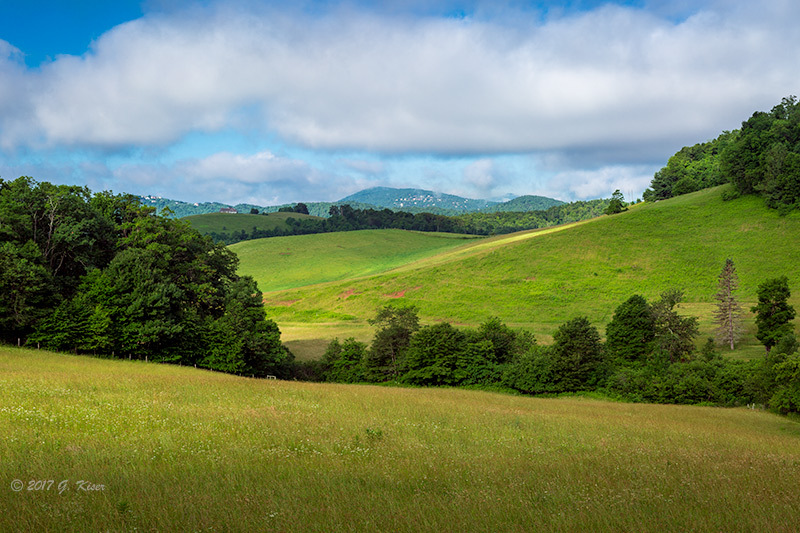 I grabbed my camera and headed out to Yadkinville. All the way there, I was trying to talk myself out of trying to photograph the car. It was on a business property, but I had a sneaking suspicion that the owners were the house right next door. Would they let me photograph the car or not? When I drove past the car, the lighting actually looked really good and the sun was in the perfect position to light the car like I had always wanted. The parking lot seemed very small, and very much like an extension of the house. I drove by, not really wanting to face a armed homeowner this evening. However, the more I thought about it, the more I wanted to give it a try. I turned around, and pulled into that small parking lot. I walked over to the house and rang the doorbell. No answer. I went back over to the garage and knocked on the door. No answer there either. At this point, I went back to the car with the intention of leaving. However, I looked around, and saw that I was in the wide open. There was even a neighbor across the street mowing. Nobody seemed to care that I was there. What I was wanting to photograph was right off of the road, and I was comfortable with that. I brought the camera out slowly giving ample time for anyone to voice their displeasure at my presence. That never came, and I was able to mount my 24-70 lens with a polarizer with no issues. I went and set the tripod up and started to make compositions. I started high, and worked lower, and the lower I went, the closer I went. Still nobody was paying me a bit of attention. I was very careful not to get too close to give anyone the indication that I might be up to no good. After about ten frames, I decided it was time to call it a day. I had pressed my luck long enough, and felt that I had a great picture in there somewhere. Hmmm, only ten frames thus far. The sun was still up, and my shutter finger was itching for more action. I decided to continue off into the sunset in search of...well, a sunset. I wasn't in the mountains, but this was farm land, and I was hoping to find something with a barn, or open lands that would work under the sky that was developing. It wasn't the best sky I had ever seen, but it was developing into a decent potential for a sunset. As I was driving along Courtney-Huntsville Rd (one of my cycling roads as well), I found an old Combine on the side of the road. It was not an old abandoned farm implement like I would normally have been drawn to. It was an active piece of machinery. What I liked about this was the sky behind it, and the fact that the Combine was in it's natural setting. What the heck! I might as well see what I can do with this scene as the sun was quickly dropping. I pulled over and got my camera out. I started with a 70-200mm lens, but quickly found that I wanted to get a little bit wider, so I swapped my 24-70mm back on. 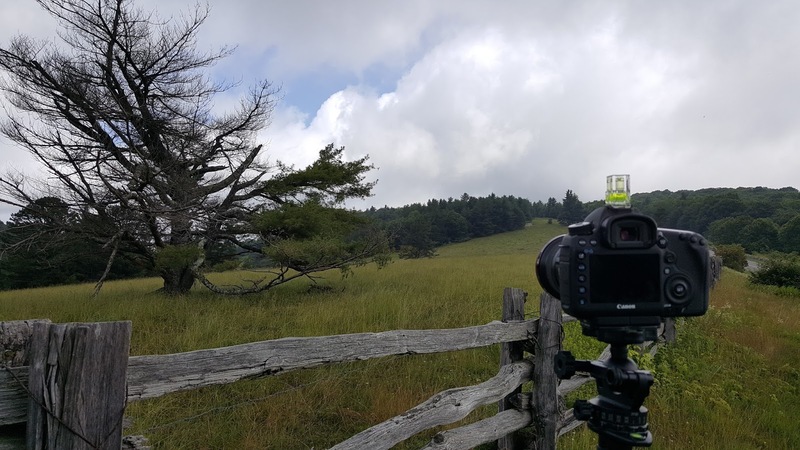 Since the compositions I was looking at were facing North, I decided that I would go ahead and add an intensifying polarizer to help with the sky. In a couple of minutes I was back at making compositions. This lens was working out much better. The sky was looking really cool, and I was thinking that I could deal with the contrast difference by processing the RAW file with a little care. I opted not to add an ND Grad since my compositions kept the combine well into the horizon. I think what drew me to this rather simple composition was that it was full of primarily horizontal lines that repeated through the picture. 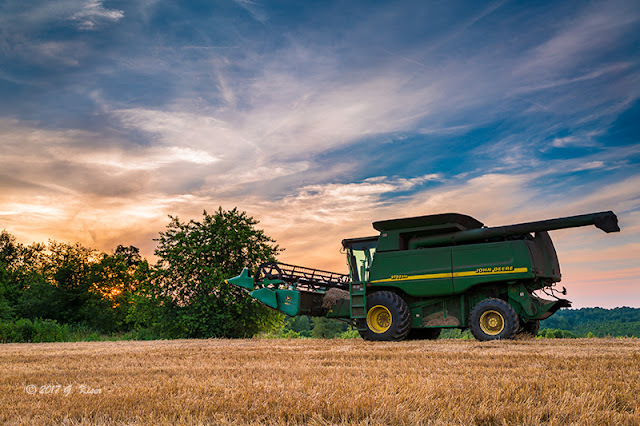 The clouds, the boom,the yellow stripe, the very shape of the combine, and the rows in the field. They all repeated the same pattern. It was a relaxing scene, and one that told a story. 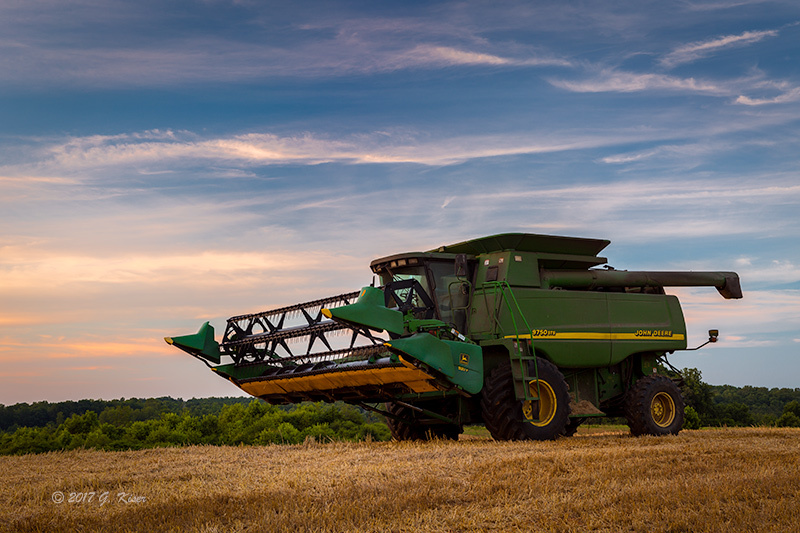 Whenever, I tried to include the sunset to the West, the combine went too far into the shadows. When I started to process the images, I wasn't able to bring the detail out without causing a ton of digital noise. That was not acceptable and I chose to toss the pictures out. However, Toni came in and took a look at what I was working on. She liked the one with the actual setting sun included. I explained my position, and she balked. She liked it and wanted it in the gallery. Well, I hate to tell her no, so I bypassed the image and didn't include it in my final cut. Well, I didn't say no...but I didn't do it either. As I was getting things ready to go into the blog, I remembered that I actually had taken a series of images of that scene with the intention of experimenting with HDR photography. I went back into Lightroom, and found the three images. I did a quick merge and looked at the final product. I wasn't a fan. It was washed out, and didn't really look all that great. But I had never done this before, and knew that I would need to do a little polishing of the image. Well, as I started to move the sliders around, I started to see a lot of potential. I completed the process and decided that this one could work. There was no noise in it, and the colors were pretty great. I was wishing that the combine was something different, but beggars can't be choosers. The picture worked, and captured the scene that Toni liked better than my first pick. So, in a way, I did say yes after all. It was a quick trek, but at least I got out of the house with the camera. I also photographed two different scenes that I had never pulled a camera on before. 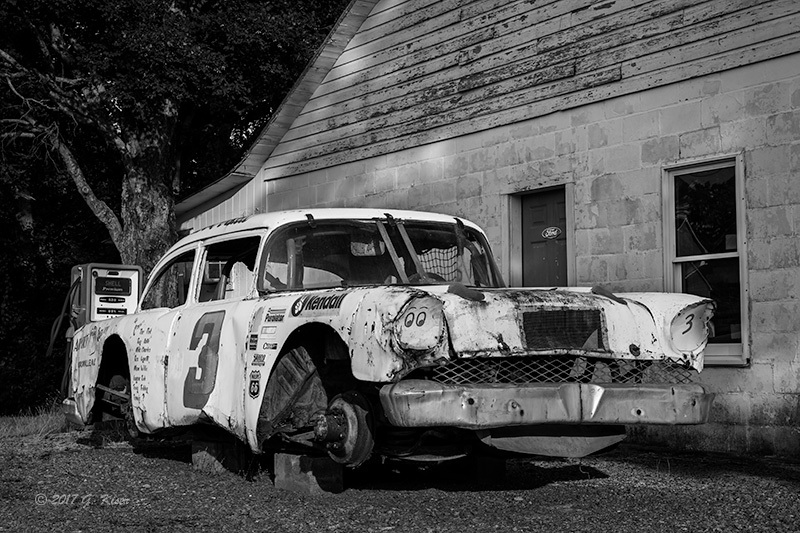 I was ecstatic about the old race car when I started the processing. it turned out better than I had envisioned it. Showing me once again, when that inner voice says "go", I had better listen to it. I also did my first even HDR photograph, and found that I actually like the effect. I didn't over process it, and it doesn't have that grunge look to it. It is actually quite natural, and appears as my eyes saw it. That is always the goal with my processing. I want it to appear natural, the way I saw it at the time of the capture. This fit the bill, and I was quite happy with the outcome. in fact, I am happy with all three of the shots that I decided to keep, and the one black and white conversion turned out very good as well. OK, I'll be the first to admit, I've been caught up in landscapes for quite a while now. It has been a long time since I've gone out to shoot any old iron. That is actually for a couple of reasons. First and foremost, I have been having a lot of fun with landscapes and getting out on some of the trails around our mountains. 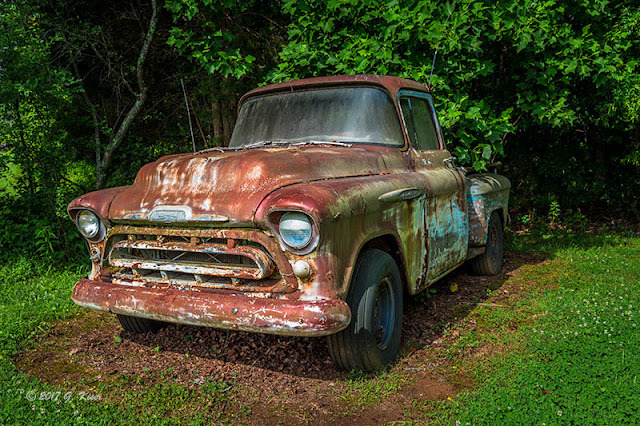 Second of all, it is not the easiest thing to find these old cars and trucks as most of them have been tucked away deep within properties, or have been hauled off. Those that are still visible, tend to suffer from the same issues...owners with guns. I've been met more times than I care to remember by owners of these gems holding a firearm at their side while they inquire as to my purpose. A vast majority don't understand my want to photograph their vehicles, and the remainder are skeptical of my intentions. This takes a lot of the fun out of what I actually really enjoy photographing. As I have been out and about over the last several months, I've been on the hunt for some old vehicles. I finally found one that was in a pretty good place in Walkertown. The problem was, it was well within the property and I knew I would need the owner's permission to gain access to it...at least to photograph it properly. I had made the approach to the house about 3 times over the course of the last six months in hopes of catching the owner at home. Each time, I was met with no answer at the door. This was infinitely better than being greeted by a gun, but gave me no ability to get close enough to shoot the truck. Finally, a couple of weeks ago, while Sierra and I was riding around (without a camera), I decided to give it another try. Sure enough, there was a gentleman sitting in a chair at the end of the driveway. As I pulled up into the driveway, I got that feeling that I might not be met with the best of receptions. I asked that Sierra stay in the car just in case. Much to my surprise and relief, the owner was very hospitable, even if just a little cautious. Hey, I don't blame him at all on that. I introduced myself and what I was asking about. After a nice long conversation, I had his blessing to return and photograph the truck when the conditions were right...and when I had my camera. He just asked that I let him know I was photographing it. That, I can live with. Well, after many, many days of the weather being wrong, or me being at work, I had the opportunity to go out before going in late to work. Initially, it didn't look like things would work out. The clouds were good first off, but the color temperature was too cool. As the temperature got warmer, the clouds got thinner and the lighting too harsh. At 9:15, at about the last possible moment, the light softened and I saw potential with the way the truck was situated. I grabbed my gear and headed out to the truck. Of course, the lighting started to change as I got closer, but I decided to see if the owner was home and if so, I'd give it a try. I pulled into the driveway and sure enough, there was the owner sitting in his chair. The lighting was decent, although not exactly what I was hoping for. Oh well, I was here, I might as well see how things go. I stopped to talk with him for a quick minute, and he again gave me permission to go and photograph the truck. He, of course, took that opportunity to do some maintenance to the pool which was right by the truck. He wanted to keep an eye on me, and I completely understand that, and respect that. At least he wasn't right over my shoulder as I have had happen in the past. The lighting wasn't the best, but as I had previsualized, the truck was out in the open and would be uniformly lit by the morning sun. There was enough thin cloud cover to keep the highlights under control, so I was able to make things work. I went ahead and fitted my 24-70mm lens which is my go to lens for this type of photography. To that, I added an intensifying polarizer and started to go to work. I was very happy with the trees to the rear of the truck as they provided the best backdrop I could have hoped for. I also found a couple things that I could incorporate into the photographs that I had not seen from the seat. There was an old stump with a hoe on top of it. I was able to use that as a great foreground. 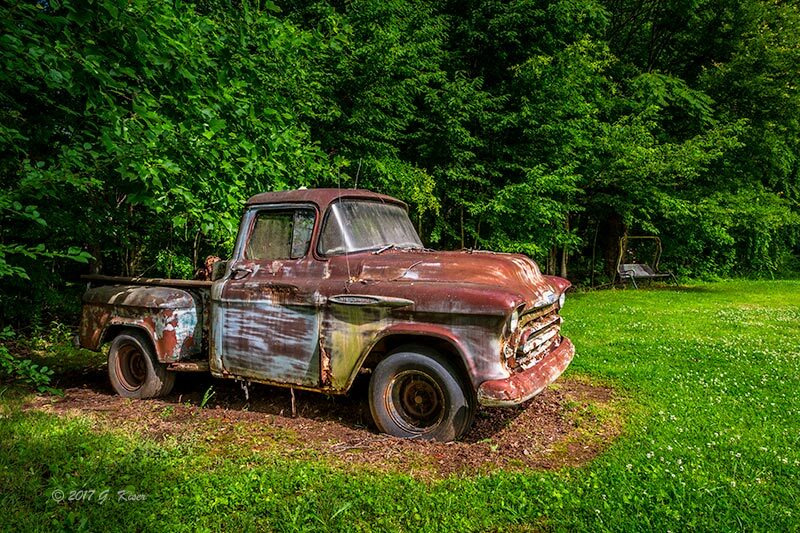 There was also an old porch swing right at the tree line which I used as a balancing element to a passenger side shot of the truck. The truck was positioned in such a way that I could work both sides equally well with neither being in the harsh light. I had been expecting to photograph this in a bit more cloudy condition, and might return to do just that. However, I must admit, I was pretty happy with the rather dramatic lighting that I was presented with this morning. There was enough to where I could get shadows, but not so much that the contrast was distracting. Overall, I was pretty happy with my time out there. I spent about 30 minutes shooting, and in that time, I got about 20 frames. Of those, I am thrilled to have three images I would consider keepers. It was also very nice to get back to shooting old iron. I've got the bug again, and am looking forward to finding more out in my neck of the woods. As always, if you are in the central to western part of North Carolina and have access to something like this, please let me know. I'm always on the hunt for this type of subject.